With his exceptional basic paces and his natural ease shown under saddle Distelzar has caused a sensation. 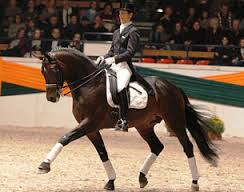 In 2001 Distelzar won the Trakehner Championship with a total of 9.0 points. In 2002 he became the vice-champion at Bonn-Rodderberg. The stallion was qualified for the Bundeschampionship for young horses and the world Championship of the Young Horses in Verden in 2003.